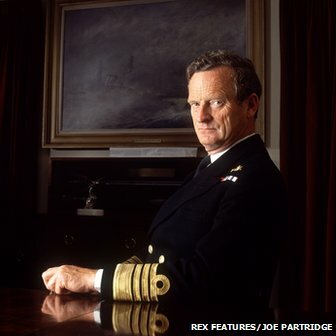 An admiral who led Britain’s task force in the 1982 Falklands War has died after a long illness, aged 81, his daughter has told the BBC. Adm Sir Sandy Woodward was commander of the carrier force sent by PM Margaret Thatcher to retake the Falklands. He served as deputy chief of the defence staff from 1985 and was promoted to admiral in 1987. David Cameron said the UK was “indebted” to Adm Woodward for his role in ensuring freedom for islanders. “The admiral was a truly courageous and decisive leader, proven by his heroic command of the Royal Navy Taskforce during the Falklands conflict,” said the prime minister. Daniel Allan, founder of the Falklands United Movement, which represents some islanders, said he was a “modern-day hero”. “We owe him a debt of gratitude and he is in the thoughts of every islander, past and present, today,” he said. Defence Secretary Philip Hammond said he would be remembered as the “Fighting Admiral”. “Adm Woodward served his country with distinction throughout his career,” he said. First Sea Lord Admiral Sir George Zambellas said: “Undaunted by the challenge of fighting a capable enemy over 8,000 miles from the UK, in the most demanding and extreme of weather conditions, and against uncertain odds, Admiral Woodward’s inspirational leadership and tactical acumen – meshing the realities of the higher political command at home with the raw and violent fight at sea – was a major factor in shaping the success of the British forces in the South Atlantic. It was Adm Woodward who wanted to torpedo the Argentine ship the Belgrano because of the threat he believed it posed to British forces, even though it was outside the exclusion zone when sunk – a decision agreed by Margaret Thatcher. He did not regret the move, saying Britain never realised how close it came to losing the war. After retirement, Adm Woodward continued to speak out for the navy, angered by the scrapping of the UK’s aircraft carriers and the Sea Harriers, which had proved so vital in retaking the Falklands. He described the decision as appalling, and warned the UK would no longer be able to retake the islands as it did more than 30 years ago. Adm Woodward was born John Woodward in Penzance, Cornwall, on 1 May 1932, according to the Who’s Who database. He trained at the Royal Naval College, Dartmouth, joining the navy in 1946 at the age of 13, and quickly rising through the ranks to command submarines. During his time serving in submersibles, Adm Woodward married Charlotte Mary McMurtrie in 1960 and they had a son and a daughter. When Argentina invaded the British overseas territory of the Falkland Islands on 2 April 1982, he was a newly appointed rear admiral and acted as commander of the Carrier Battle Group from the flagship HMS Hermes. Three days later the first British task force ships left Britain, and by 14 June, following a number of key battles, the British had liberated the capital, Port Stanley. Among the most controversial actions of the British during the war was the sinking of the Argentine cruiser General Belgrano, killing 368 crew. BBC defence correspondent Caroline Wyatt said Adm Woodward had wanted to torpedo the ship because of the threat he believed it posed to British forces, even though it was outside the exclusion zone when sunk – a decision agreed by Mrs Thatcher. During the conflict, an estimated 600 Argentines were killed along with 255 UK servicemen and three Falklands civilians. Adm Woodward, who also went on to be the Flag Aide-de Camp to the Queen, was knighted for his service in the Falklands campaign in 1983. He retired in 1989 but never forgot his time in the Falklands, later writing a book titled One Hundred Days on his experiences and chairing the Falkland Islands Memorial Chapel Trust, which raised money to build a chapel in Pangbourne, Berkshire, in memory of those who had died. Robert Fox, defence editor of the London Evening Standard, said Adm Woodward had to take “some of the biggest risks of any commander in modern British history”. “He knew how to take risks… the lack of air cover, the way the whole thing was conducted against the unknown – it would simply be deemed as unacceptable by Westminster today,” he said. Writing for the Daily Telegraph earlier this year, Adm Woodward described working with Mrs Thatcher between 1985 and 1987, when he was the head of defence staff operations and would attend cabinet meetings. He said their relationship was one of mutual respect, describing Mrs Thatcher as “the best top executive I’d ever met”. In June 2011 Adm Woodward wrote in the Daily Mail that he feared the Falkland Islands were “now perilously close to being indefensible”. “Twenty-nine years ago today, we reclaimed the Falklands for Britain in one of the most remarkable campaigns since the Second World War,” he wrote. And in written evidence to the Commons Defence Committee in May of this year, he warned Britain would be unable to defend itself if cuts to the navy continued to be made. This entry was posted in UK Submarines and tagged Admiral, Falklands, Grampus, HMS Tireless, Sandy Woodward, Submarine, Warspite on August 6, 2013 by jasonlockley.